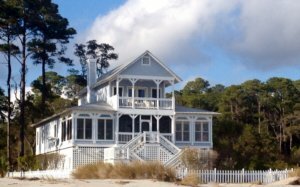 Daufuskie Island is a barrier island at the southernmost tip of South Carolina, located between the world famous golf mecca of Hilton Head Island, SC and historic Savannah, GA. The island is five miles long and 2.5 miles wide and accessible only by boat. While Daufuskie provides a secluded, beautiful coastal setting with golf courses and luxurious resorts, its true treasure is the enduring history and preservation of its diverse heritage. Native Indians first inhabited Daufuskie Island until the 16th century when European explorers arrived. The name, “Daufuskie”, is derived from an Indian word meaning “land with a point”. The tip of the island, Bloody Point, got its name following three violent encounters between the Europeans and the Indians along the shore during the Indian War of 1715. Visitors enjoy combing the beaches and land searching for Indian artifacts such as arrowheads and pottery. 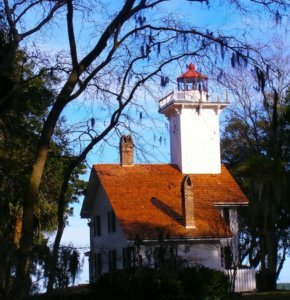 During the Revolutionary War, most Daufuskie islanders were British loyalists while neighboring Hilton Head islanders were patriots. 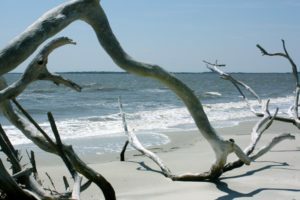 Prior to the Civil War in 1861, Daufuskie Island was comprised of eleven plantations – Bloody Point, Benjie’s Point, Cooper River, Eigleberger, Haig’s Point, Mary Dunn, Maryfield, Melrose, Oak Ridge, Piney Islands, and Webb Tract – it is now divided among four private communities and the outlying historic district. The modern revitalization of Daufuskie began in the 1980’s as three of the largest pieces of property on the island, the plantations of Haig’s Point (now known as Haig Point), Melrose, and Bloody Point were developed into residential and resort golf communities attracting high-end buyers. While visitors are initially enchanted with the beauty of Daufuskie, its rich history is what continues to captivate tourists and residents alike. Each of the developments has been carefully planned to highlight the heritage of the island, and their investors and members continue to prioritize the preservation and improvement of the ecology, the native islanders, and the historical significance of Daufuskie. 2011, The Palmetto Trust developed the Daufuskie Endangered Place Program to restore many of the original Gullah homes on the island and allows visitors to rent the homes in order to experience what life may have been like for the Gullah people. Tourism is thriving once again on Daufuskie, both in the private club communities and throughout the historic district. The recent development of a marina, restaurants, galleries, artisan studios, tour businesses, and even a new rum distillery, not only mean economic prosperity but also preserve and highlight the identity, character and heritage of Daufuskie.